The goal of the group is to develop computational tools to accurately predict the fate of hydrocarbons found in crude oil that were released into the environment during the Deepwater Horizon oil spill and help to guide risk management and response efforts in mitigation and restoration of the economy and the ecosystem. CARTHE is comprised of 26 principal investigators (PIs) from 12 universities and research institutions distributed across four Gulf States and in four other states. The Director of CARTHE is UM Rosenstiel School of Marine & Atmospheric Science Professor Tamay Özgökmen. 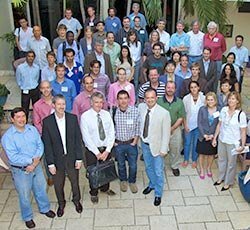 Sixty-five oceanographic modelers and observational scientists spent two days meeting in Miami. The meeting was kicked off by Özgökmen, who was joined by Chuck Wilson, GoMRI Chief Science Officer, Kevin Shaw, the Program Manager for the project as well as management group from the Consortium for Ocean Leadership. The team shared presentations, participated in plenary sessions and met in breakout groups to discuss the many facets of CARTHE.